Duhamel & Singer; H. Duhamel & Sons Co.
For well over a half century the highly respected firm of Duhamel & Singer, and its successor, H. Duhamel & Sons Co. served as Brooklyn's premier source for high class carriages and funeral vehicles. They successfully made the transition to motorized hearses, albeit in a small way, surviving into the late 1930s as a full service auto body repair facility. The firm was founded by a French Canadian immigrant named Hilaire (aka Hilary) Duhamel (wife Mary) who learned the trade from his father Isaac H. Duhamel, a well-known wagon builder/blacksmith who was born in St. Hyacinthe County, Quebec – a small community located 35 miles east of Montreal in 1818. According to the 1851 Census of Canada East (Quebec), Canada West, New Brunswick and Nova Scotia, our subject, Hilaire Brasseur Duhamel, was born in July 1840 in St. Hyacinthe County, Quebec to Isaac H. and Louise (Maurier) Duhamel. "Hillary Duhamel 201 3d street factory – income $92"
"Duhamel Hilaire, smith, 1594 Third av." "Medard Singer (coach mkr) h. 171 Allen"
Medartus Singer was born October 15, 1834 in Schwarzwalduskreis, Wuerttemberg, Bavaria, to Johannes and Marianna [Klotz] Singer. Naturalized in 1872, his occupation on the application being 'carriage maker', his address 221 Christy St. Witness was Carl Ernd Schwarnd, whose occupation was also carriagemaker. Singer married Magdelena - aka Lena - (Roth) and their union was blessed with the birth of two children; a daughter, Pauline (m. Brighton - b. 1869 – d. 1924) and son, Albert (b. 1889) Singer. "Medartus Singer, carriagemkr, h. 196 Wilson." "Medartus Singer, carriagemkr, h. 89 Wythe av"
"Duhamel & Singer, carriage makers, 169-171 Clymer St."
"Duhamel & Singer, of 169 Clymer street, employ 16 hands, pay nearly $10,000 for salaries and wages, and produce annually nearly $20,000." Ironically, one of the Northeast's most famous carriage builders, James N. Brewster, of Brewster and Co., lived down the street at the foot of Clymer St. in the Abraham A. Remsen farmhouse from 1850-1870. Clymer Street was named for George Clymer, signer of the Declaration of Independence. Constructed of hewn timber in 1759, the Abraham A. Remsen farmhouse stood back from the road near the end of the street. Having heard that the houses on the Isle of Cuba were painted a blue color, Brewster decided to paint the cedar shingles blue, which contrasted nicely with the wisteria vine that covered most of the house (which was torn down in 1879 to make room for a factory). "Medard Singer (carriage mkr) 169 Clymer h.196 Wilson"
"No. 8. 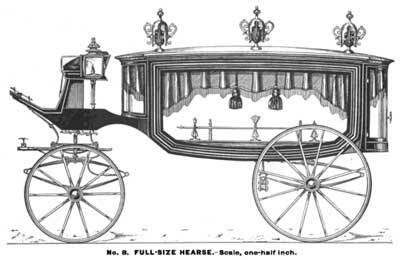 FULL-SIZE HEARSE.-Scale, one-half inch. "We are indebted to Messrs., Duhamel & Singer, of Brooklyn, N. Y., for permission to publish this design, which not only represents an individual pattern built by them, but also illustrates in a general way, so far as the shape of the body and moldings is concerned, a leading and representative pattern now popular in New York, Newark, etc. 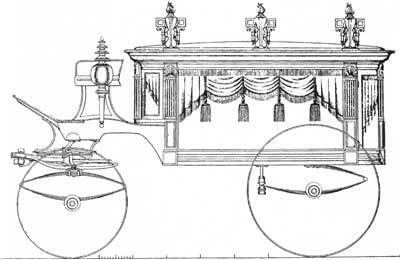 "It will be seen, by reference to fashion plates previously published in The Hub that, until a few years ago, the side moldings of Hearses were commonly given a multiplicity of corners, sweeps and angles. This tendency led to a reaction, the result of which we now see in the endeavor to avoid all superfluities and to return to plain styles. The glasses shown in our cut have six corners each, and the lines of the moldings are as little swept as a long body will permit of without giving an angular or stiff appearance. Another advantage of this finish is, that the drapery is displayed to good advantage, and we notice that most of those firms who make a specialty of fine Hearses pay much attention to artistic and tasteful trimmings, which indeed most attract the eye of the general public. The form of driver's-seat shown in our cut is original with Messrs. Duhamel & Singer, and is also used by them on Coaches. It is claimed that, when represented on paper, this boot does not appear to so good advantage as on the vehicle itself (which we can readily understand), but that customers generally approve of it. "Dimensions.—The principal dimensions are as follow: Width of body, 39 in. Wheels, 3 ft. 5 in. and 4 ft. 1 in. Hubs, 5 3/8 x 8 in. Spokes, 1 ½ in. Rims, 1 3/4 x 1 ½ in. Tire, 1 ¾ x ¾ in. Axles, 1 ¾ in. Springs, 5 plates, 1 3/8 in." "Medard Singer (carriage mfr) 169 Clymer h.196 Wilson"
"Medard Singer (carriage mfr) 169 Clymer h. 96 Clymer"
"Trade Booming - H. Duhamel & Co., 171 Clymer st., Brooklyn, N.Y., formerly Duhamel & Singer, report trade booming. They are behind on their ordered work owing to the continual increase in their trade. The firm are building quite a number of fine coaches of the latest design to order and claim that their work is much sought after." "Medart Singer, carriages, 245 4th ave., h. 718 Degraw"
"Medart Singer, carriages, 245 4th ave., h. 619 President st."
"Christian Danzer, Blacksmith, 333 Nevins, h. 632 President st.
"Medart Singer, carriagemkr / wagonmkr, 245 4th ave., h. 619 President st."
"H. DUHAMEL, formerly of Duhamel & Singer, has just completed his handsome brick carriage factory at Wallabout and Middleton sts., Brooklyn, N. Y. It is one of the best equipped in that city. The dimensions are 65 x 70 feet, four stories high. Mr. Duhamel has a good reputation for turning out first class heavy work and in visiting the works some nice specimens were seen on the floors." "Scale, 3/4 inch to the foot. 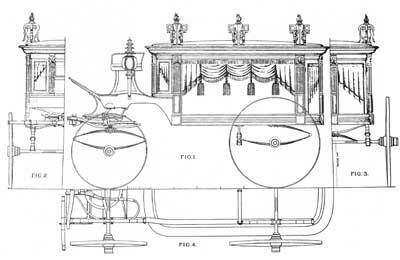 "The working draft given this Month is that of a hearse of modem design and finish, from a design by H. Duhamel, an 1899 graduate of the Carriage Builders' Technical School, from which hearses have been built by H. Duhamel, of Brooklyn, New York. The proportions and general features of this hearse are strong recommendations, and reflect credit upon the designer and builder. Fig. 1 shows the side elevation, giving location and form of pillars, boot, front and back end extensions of the body, the layout of the moldings, draping of the curtains, and location of the urns. Fig. 2 shows one- half view of the front end of the body, with corner and center lights and short pillars, the boot outline being shown by dotted lines. Fig. 3 shows the half of the rear end, with doors, center pillar, and rear suspension. The pillars are interchangeable. "The dimensions of the body are: Length of the body, from toe-board to back of moldings, 11 ft. 6 in. Height, 3 ft. 9 in. over all; from bottom of sill to crown point of the roof, 3 ft. 9 in. Extreme width, outside of moldings on the top, 4 ft.
"Width of table, in. Length of table, 6 ft. 6 in. Height of body from the floor, 33 in. Pillars, 4'/2 x 2 in. Top moldings, 6 in. square. Bottom moldings, 51/2 x 2 in. Sweep of back end, 131/2 in. Front sweep, 14 in. Urns, 111/2 x 5½ in. square. Width across the front of the boot, 34 in. Wheels, front, 36 in. and 46 in. Hubs, 71/2 in. long, 61/4 in. diameter. Depth of felloes, 1/4 in. Tread of felloes, 1% in, Spokes, 1% in. Number of spokes, twelve and fourteen. Tires, rubber, 13/4 in. "Springs, front, 37½ in. long from center to center, four plates, 1½ in. steel, 101/2 in. open over all; main plate No. 2, other plates 2, 2 and a, clipped on. Back springs, 37½ in. long, center to center, 111/2 in. open over all; 11/2 in, steel; main plate No. 2, other plates 2, 2, and 3. Back cross spring, 38 in. long from center to center, 3½ in. open, out-to-out; 11/2 in, steel, four plates; main plate No. 2, other plates Nos. 2, 2, and 3. Axles, full Collinge, for 5½ in. hub. Fifth wheel, 20 in, in diameter. Track, 4 ft. 8 in. "Seat rail, handles, pole crab, whiffletree tips, hub bands, cap and rollers and pins on the table hand plated, as are also the lamps. "Painting with a set of black pillars and urns, which are made changeable. Trimming: Draperies, broadcloth of black, white and purple. The best of white trimming leather for the seat. The moldings and carvings are handwork." "DUHAMEL, HILARY, 127 Wallabout Street, Brooklyn. H. Duhamel & Sons, President, Treasurer and Director. "DUHAMEL, L. J., 127 Wallabout Street, Brooklyn. H. Duhamel & Sons, Director. "DUHAMEL, O. J., 127 Wallabout Street, Brooklyn. H. Duhamel & Sons, V. Pres. and Dir." "DUHAMEL – On Sunday, September 29, 1912 at Lakewood, N.J., HILAIRE DUHAMEL, aged 71 years. Funeral from his late residence, 61 Lynch St., on Wednesday, October 2, at 9 a.m.; thence to the Church of St. Louis, Ellery St., near Nostrand Av., where a solemn mass of requiem will be offered for the repose of his sole. Interment in St. Joh's Cemetary." "Hilaire Duhamel, of the firm of H. Duhamel & Sons, manufacturers of automobiles in Brooklyn, died on Sunday at Lakewood, N.J., aged 71. He left five sons and a daughter." "Hilaire Duhamel, long identified with the vehicle industry in Brooklyn, N.Y., died September 29th at Lakewood, N.J. to which resort he had gone seeking a renewal of his health. Mr. Duhamel was born near Montreal, Can., but went to Brooklyn 46 years ago where he founded what was then a carriage but now an automobile factory under the firm name of H. Duhamel & Sons." "The Late Hilaire Duhamel In the October number of this journal we published a brief announcement of the death of Hilaire Duhamel, president of H.Duhamel & Sons, automobile body builders, Brooklyn, N. Y. Hilaire Duhamel was long… (text missing)"
"DUHAMEL, LOUIS 127 Wallabout St Brooklyn; H Duhamel & Sons, Sec & and Dir. "DUHAMEL, NAZAIRE 127 Wallabout St. Brooklyn; H. Duhamel & Sons, Pres., Treas., and Dir. "DUHAMEL, OMAIRE J. 127 Wallabout St. Brooklyn; H. Duhamel & Sons, V. Pres. and Dir." "Charles H. T. Gerstenberg, one of the oldest carriage manufacturers in the eastern district, died May 23, after a brief illness at his home, 96 Taylor street, Brooklyn, N. Y. Mr. Gerstenberg moved to Brooklyn from Manhattan 40 years ago and became identified with the carriage manufacturing business as a member of the firm of H. Duhamel & Co., in Clymer street. Later he branched out for himself and had a factory in Bedford avenue. A few years ago he went back to Clymer street and remained there until his death. Lately he had confined himself largely to the making of automobile bodies. He is survived by his widow and two sons." "NAZAIRE J. DUHAMEL, member of the firm of H. Duhamel, Sons, automobile manufacturers at 127 Wallabout st., Brooklyn, died at his home, 44 Sherman Street, Brooklyn, on Sunday." "OMAIRE J. DUHAMEL, on Dec 3, 1928, husband of Margaret E. (nee Brennan) and father of J. Omer, Kevin, Stephen and Lucille. Funeral from his late residence, 234 Seeley St., on Thursday, Dec. 6, at 9:30 am, then to the R.C. Church of the Immaculate Heart of Mary, where a solemn requiem mass will be celebrated. Interment at St. Johns Cemetery." "H. Duhamel & Sons, (NY cap. $25,000), Louis J. Duhamel, pres.-treas; Kevin F. Duhamel, v-pres. ; Jos. Omer Duhamel, sec. ; auto mfrs., 127 Wallabout St."
Louis J. Duhamel's (b. Aug. 7, 1883) WWII Draft Registration, dated 1942, lists his employer as Rittberg & Vetter, 355 Butler St., Brooklyn, New York and I could locate no listings for H. Duhamel & Sons after 1939. During the 1940s and 1950s 127 Wallabout was home to the Kason Hardware Corporation, manufacturers of commercial refrigerator hardware. The property was later acquired by the Sonabend-Katz, Inc., a real estate concern, and it was eventually razed to make way for the Bnos Spinka Elementary School which occupies the property today.